When we last left off, I was about to go on a walk with Lisa. We had a great walk....when I came home I was ready for dinner! 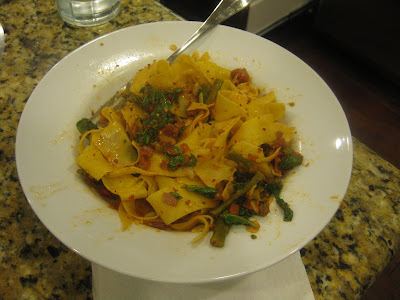 I decided to have the leftovers from Firenze last Thursday. I usually give leftovers about a week before I threw them away so I was within my window. I got the kids to bed and that's when I started to feel it.....the beginnings of a UTI. I get them every so often and if you've never had one before, count yourself lucky. I wouldn't wish it on anyone. I started chugging water and I took one of the PX meds for it leftover from the last time got one. I had hubby bring me home some cranberry juice after his work dinner. I think I finally felt slightly better around 11PM because that's when I fell asleep. I woke up feeling bad and started with the water and cranberry juice again. 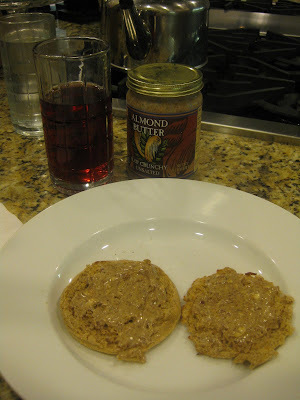 I needed something in my stomach because the medicine is strong so I had a light wheat English muffin with almond butter (my new favorite)....nothing else sounded good. I got the kids to camp, picked up a PX for antibiotics and spent the rest of the day in bed. I have been living on Wheat Thins and cranberry juice. I picked up the kids and laid back down for a bit. Hubby is working again so I guess I need to get myself up for some dinner now. Sorry this is such a downer post. Boo!! Hopefully tomorrow I'll feel better!! How long do you give leftovers before you trash them? Ugh, I used to get UTI's all the time. Haven't lately (yay!) Hope you feel better soon. How did you get an Rx for the antibiotics without going in? I always had to have one of my friends call in a script so that I didn't have to go for an office visit. I usually toss leftovers after a week as well. I love leftovers so they never usually last that long. I used to get them in highschool - miserable! :( Boo! leftovers usually last 2-3 days before i throw them out.. cuz then its too dry i think. Ugh...my last UTI was after I had my son. Not only did I have a newborn at home, I couldn't pee! But needed to! It was awful:( Hope you feel better soon! I only give leftovers about 2 days...I have a phobia of it going bad. I hope you are feeling better soon! I hate getting a UTI...they are not fun at all! I usually give leftovers 3-4 days before they get thrown out. Next time, let me know if you need anything...I have a cache' of UTI meds on hand...there are even some great OTC pills out there. BTW, my gyno said only FRESH cranberry juice has the stuff in it to help with the malady. Feel better soon, my dear friend!